The National Pork Board honored four farms, including one from Oklahoma, as recipients of the 2012 Pork Industry Environmental Stewards Award at the annual National Pork Industry Forum being held here. The award, now in its 19th year, recognizes producers who demonstrate a firm commitment to safeguarding the environment and their local communities. 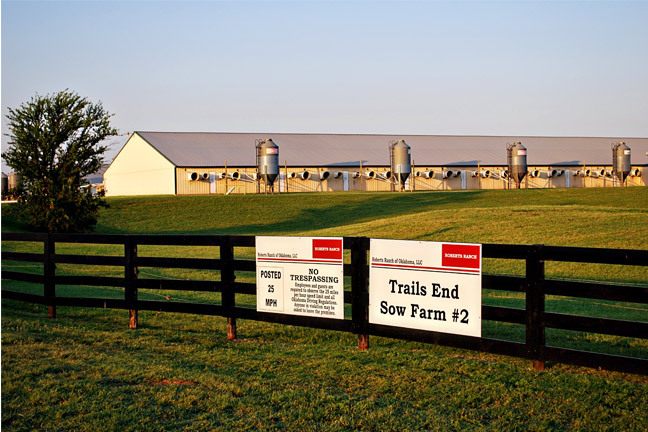 --Trail's End Sow Farm, Ames, Okla. - Caring for 10,500 sows and their litters in a productive and environmentally friendly way is what Jeff Mencke, production manager for Roberts Ranch of Oklahoma, does, along with Bill Barnes, who oversees the farm's environmental operations. The sow farms, part of Hanor in the Ames area, also farm no-till cereal rye, winter wheat and triticale on 278 acres. --Future View Farm, Willow Street, Pa. - Jeff and Sue Frey finish 12,000 pigs a year and raise corn, soybeans, wheat and barley on 675 acres. Sue also uses her degree in floriculture to grow and sell flowers in the farm's greenhouses. --Reed Family Farms, Ottumwa, Iowa - Ryan and Lana Reed finish nearly 4,800 pigs per year on their family farm in Ottumwa, Iowa. Despite their home burning down early in 2012, the family remains devoted to agriculture. The Reed's three children signify the family's sixth generation to farm in Wapello County. --Dahl Family Farm, Dawson, Minn. - Wayne and Laura Dahl operate a 4,400-head nursery barn and two, double-long finishing barns that have a total capacity of 4,400 head on their 240-acre farm near Dawson, Minn. In 2003, the Dahls built three, 1,100-head finishing barns, and a fourth in 2007. Plans call for son Jordan, who helps his parents with the pigs, to one day manage the farm with his wife, Ashley. "These four recipients, in addition to being committed stewards of the land, are great representatives of the thousands of pork producers who work every day to protect our environment and to be good neighbors in their communities," said Conley Nelson, president of the National Pork Board and a pork producer from Algona, Iowa. "We are pleased that we can honor them here at our annual meeting as examples of how pork producers demonstrate the We Care principles every day." The Pork Checkoff honors the Stewards with a cash award, a plaque, a video and with coverage in the Pork Checkoff Report magazine. The Stewards also are featured in National Hog Farmer magazine, co-sponsor of the Environmental Stewards program. The Environmental Steward award winners were selected by judges representing pork producers and environmental organizations. The judges reviewed applications from pork producers who are committed to upholding the ideal relationship between pork production and the environment. Their operations were evaluated on their manure management systems, water and soil conservation practices, odor-control strategies, farm aesthetics and neighbor relations, wildlife habitat promotion, innovative ideas used to protect the environment and an essay on the meaning of environmental stewardship. The National Pork Board is receiving applications and nominations for the 2013 Pork Industry Environmental Steward Award winners. The deadline is March 31. More information, as well as applications, can be found online at pork.org, or by calling (800) 456-7675.